Moscow is one of the few global metropolitan cities where one cannot simply speak English to get by. It is still possible to order in English in restaurants, but if you ask in English how to find your way on the streets of Moscow, you will be lucky if you receive an answer. To help you, we offer a survival set of 19 indispensable Russian expressions for newcomers to Russia, or those who are resistant to learning Russian. The Russians are always courteous. In the metro at rush hour, before they rush out of the carriage to catch their next connection and you are standing near the exit doors, often you will be asked “Are you leaving?”-” Вы выходите? ” (the pronunciation is “Vy vykhodite”, with the accent in bold). If this is not the case, move aside, and let the crowd exit under penalty of moving you unwillingly from the train. The Russian language is straightforward and relies heavily on impersonal phrases in the broadest sense. Thus, “Can we? “-“Можно?” (“Mozhna?”), for example, applies to everyone, and proves to be quite useful to request or order anything. If you are in a hurry and want to sneak between people, just say “можно” and they will move aside for you. 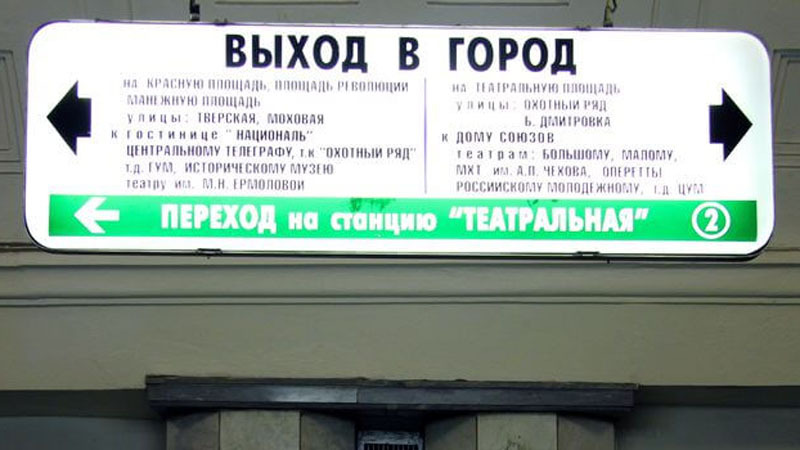 Without knowing Cyrillic, you can hardly read any signs on the streets in Russia. However, you can always ask “What is written there? “-” Что тут написано?” (“Chto tyt napisana?”). When it’s time to leave, the question “Let’s go?” can be asked in two ways; “Пошли?” – (“Pashli?”) if you are leaving on foot, or “Поехали? – (“Payekhali?”) if you are leaving by car, bus, train, or airplane. For the record, this is the historic phrase Yuri Gagarin used before taking off in his rocket for the first manned trip into outer space. It is still important to join a queue in some places in Russia, but you may be surprised to see no obvious queue. The useful phrase in such cases is “Who is last?” – ” Кто последний?” (“Kto posledniy’?”) to determine when it is your turn for service. At a store, there are two terms to remember; “How much?” – “Сколько” (“Skolka?”) to ask what the price of an item is, and “It’s a little expensive!” (“Это дороговато!”- “Eta daragavata!”) to start any negotiations to lower the price. While still in the store, it is not unusual to ask “Is this fresh? “-” Это свежий” (“Eta svezhiy?”). This question is especially useful when you want to buy meat or meat products, dairy products, or even pastries. You will be amazed that the vendors will sometimes tell you that this sausage is not very fresh, and recommend another product that is even sometimes cheaper. At a restaurant, you will sometimes need to freshen up before having dinner. A more formal way to ask where the restrooms are is “Where can I wash my hands? “-” Где можно помыть руки? ” (“Gd’e mozhna pamit ruki?”). If the sink is in another room separate from the toilets (and this is rare), be aware that туалет (“tual’et“) is also a useful Russian word! To order drinks, make no mistake on which type of glass you ask for. Water or juice is a drink, so ask for a glass – стакан (“stakan“), while for wine – вино (“vino“), you should ask for a stemmed glass – бокал (“bakal“), and for vodka – водка (“vodka”), use a shot glass – рюмочка (“ryumochka”). Several of you will choose the whole bottle of wine – бутылка (“butylka”), or a pitcher of lemonade – графин лимонада (“grafin limanada”) in the sultry summer, or the warming teapot – чайник чая (“chaynik chayya”) in the cold Russian winter. Before you leave the restaurant, do not forget to pay the bill. To ask for the bill, ask for the “счет” (“sch’et”), and pay by credit card “по карте” (“pa karte”) or cash – “наличными” (“nalichnymi”). And do not forget to leave a tip – “Чаевые” -(“chayevyye”) – so that the waitress does not think badly of you…. When visiting the doctor, the doctor’s office will require you to put on mandatory disposable plastic slippers “Одевать бахилы” (“ad’evat‘ bakhili”) – put these plastic slippers over your shoes not to dirty the floor, in the summer and winter. Here are some useful expressions to start appropriate conversations in winter; it is raining / it is snowing – “идеть дождь/ снег” (“idet’ dozhd’/ sneg”); the wind is blowing – “ветер дуеть” (“veter duyet’” ); it’s cold! – “Холодно! “(“Kholadna!”). And especially useful is the phrase “When is spring coming? “- “Когда придет весна?” (“Kagda prid’et vesna”?). You see a huge layer of snow or a giant icicle (and yes, there are!) about to fall from the roof onto a person near you? Shout “Watch out! “-” Осторожно! ” (“Astarozhna!”) so that he or she moves out of the way to safety. All enterprising romantics will appreciate being able to say “I love you” – “Я Вас люблю” (“Ya vas lyublyu“), or “you are very attractive” – “Вы очень превлекательный/ ая” (“Vy ochen’ prevlekatenlnyy / aya”). And, because you are happy in Russia, you may answer any and all responses by saying “With pleasure!” – “С удовольствием!” (“S udavol‘stviyem”)! Do not hesitate to spread the good news; CREF, it’s great! (“КРЭФ – это здорово!” – “CREF- eta zdorava!”). We sincerely hope that is what you will say if you follow our course on “Survival in Russia”! A truly affordable linguistic holiday in Russia? It is now possible!